A 55 yo female brought unconscious in causality. 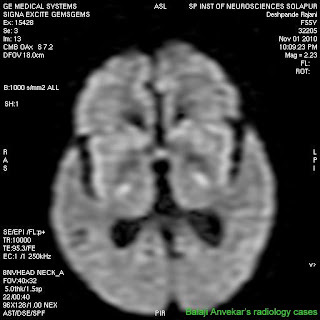 Her immediate post admission MRI Axial T2 and FLAIR images of brain absolutely normal. A subtle bilateral symmetrical faint high signals in the region of posterior limb of internal capsules. Possibility of Hypoglycaemia induced transient signal abnormality suggested. Blood sample showed low blood sugar levels, corrected according with Dextrose infusion. In pts with hypoglyemia coma, transient white matter lesions on MRI if recognised early are completely reversible and carry very good outcome. Widespread cortical lesions are also known and are associated with poor outcome even death if not treated on time.